Manhasset Bay Yacht Club in Port Washington, NY hosted the 2014 Interclub Nationals on April 5 & 6. A front greeted the sailors on Saturday morning with wind gusts pushing into the mid to upper 20-knot range, so the Race Committee postponed until 1:30pm. At that time, the RC found a small window of time to get two races in before the return of the “20-plus” conditions. Sunday’s conditions were quite different, as competitors sailed out to the racecourse in a 5 mph northwesterly only to see it die. A few waves of 2-4 mph west/ northwest breeze allowed the RC to squeeze in two more races over the course of the day. Jim Bower & Alexa Schuler are the 2014 Interclub National Champions. Jim Bower & Alexa Schuler from the Winthrop Frostbite Sailing Club in Winthrop, MA were crowned the 2014 Interclub Nationals Champs. Dave Nelson & Julia Marsh, also from Winthrop, were second, with Paul-Jon Patin & Felicity Ryan from Larchmont Yacht Club third. Rounding out the top five were Steve Benjamin & Mac Christopher (Larchmont YC) in fourth and Pedro Lorson & Mimi Berry (Manhasset Bay YC) in fifth. 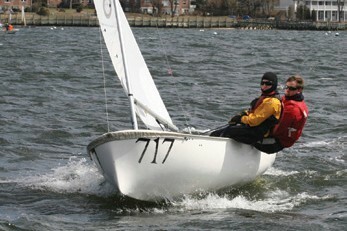 Top Masters (over 60) were Ted Toombs & Marianne Simms (Manhasset Bay YC). Saturday night’s activities included a barbeque dinner followed by a showing by Emmy-award winning Thurston Smith of his documentary Frostbiting. Following this presentation and some Q&A, some sailors found it necessary to go out into the cold, dark night and reposition some fellow competitors’ boats. The next morning, ICs were found inside the club’s MBO Room next to the morning breakfast. The Interclub Nationals was also the last leg of the Wharf Rat Challenge, whereby teams’ best two results from outside regattas are combined with their results at IC Nationals. The 2014 Wharf Rat Challenge winners are Paul-Jon Patin & Felicity Ryan, with Ted Ferrarone & Meredith Killion second and Pedro Lorson & Mimi Berry third. Results, pictures and the Frostbite documentary trailer can be found at manhassetbayyc.org.